My sister and family came to stay from Sweden last weekend. I decided to make something in advance and then I wouldn’t have to worry about cooking when they got here. 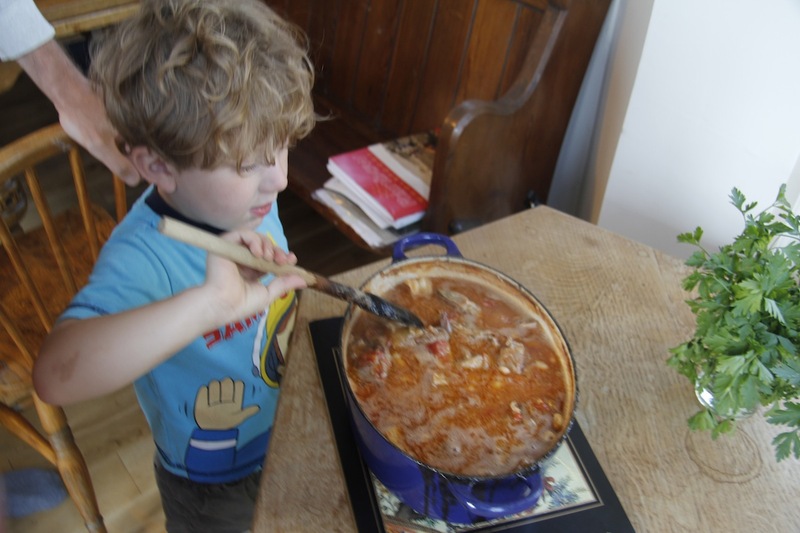 I made this lovely lamb stew using chops and bony bits from the end of the legs (not quite shanks – smaller than that). This dish is very quick to put together (although it take s a while to cook), it tastes delicious and just improves with age. Basically this dish makes me want to get some more sheep! 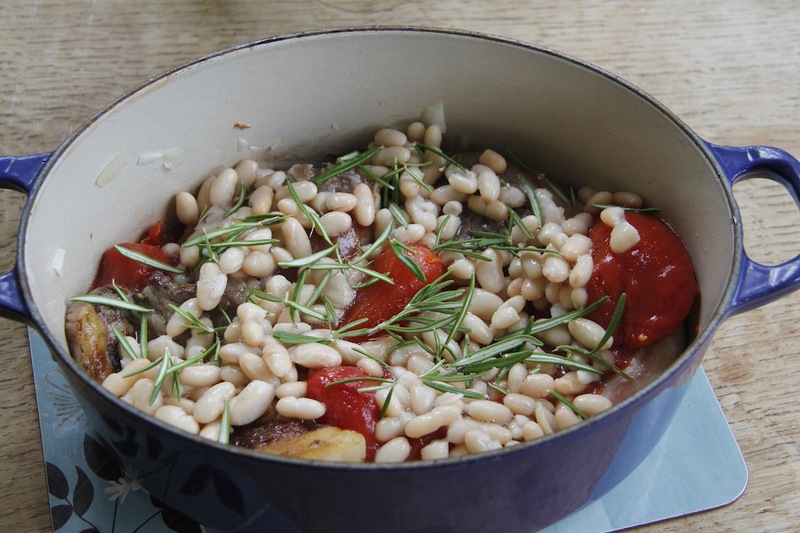 Lamb Stew: lamb chops – anything really, but ideally on the bone; two or three tins of cannellini beans; couple of tins of tomatoes, two onions, rosemary, lamb stock (or water), lard – home made if you have it – see here. Fry the lamb chops until they are brown in some lard. Fry the onions in some more lard until soft and golden. 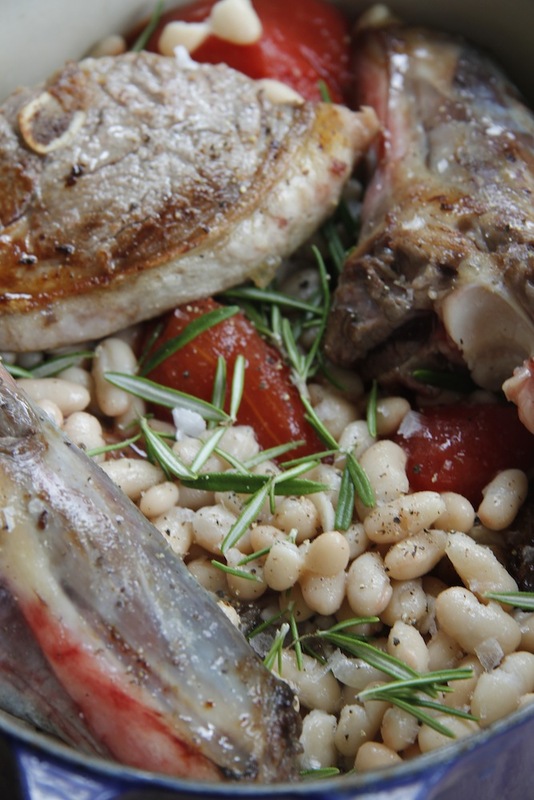 Layer up lamb chops, beans, tomatoes, rosemary and onions in the pan seasoning as you go. Pop a lid on and cook in a medium oven for quite some time until the meat falls off the bone – maybe say 2-3 hours or longer. Take out, allow to cool for a while and then pick the bones out and chop any very large bits of meat. Check for seasoning and add more beans if you want. At this stage you can simmer gently on the stove top to reduce the liquid if you want. I like it a little soupy as there is something to mop up with your bread. I served it with home made bread and beans and broccoli as Zoe likes broccoli. We feasted on the Friday night and then had leftovers on Sunday evening. I then added a little more water to the leftover leftovers and had it as a soup for lunch in the week. This looks gorgeous – my kind of meal! I’m just planning next week’s suppers so think I’ll give it a try. I’ll let you know how I get on! Oh, I hope you like it – it was very delicious. I think you could tweak it in lots of ways for variety.